Last week, I reviewed Kris Waldherr’s Doomed Queens. For anyone who needs some art inspiration or just a deliciously good read, I highly recommend picking up a copy of the book for all the divas on your christmas list. I contacted Kris to ask how she created the stunning art for Doomed Queens. Let's just say that Kris really knows how to put her babysitter, her editor and family and friends to work! Can you guess who posed for the ill-fated Amalasuntha or the discarded Josephine? Read more to find out…. Me: Could you talk a little bit about your process? What medium do you use? Did you do the art first or the writing first? Kris: My bookmaking process involves a lot of rather intuitive back-and-forthing between design, research, text and art. My first job in publishing was a children's book designer, so I tend to approach my books from a design standpoint first, and work from there. In the case of Doomed Queens, I knew I wanted it to look rather Victorian, so I researched books of that era, looking at type treatments, their bindings and illustrations. I also did enough research on queens to create a general outline, which I then used to layout a book dummy. From there, I began to write and make art for the book, usually researching and writing as I go along. However, I do adjust the book dummy and design as I work through the book to stuff in new research finds or other "eureka" ideas and art. There's a lot of refining and reworking involved. The art itself was created with black and white ink, watercolor, gouache and pencil on Arches watercolor paper. I usually work on several drawings at once, going back and forth between them as inspiration allows. In the case of Doomed Queens, I worked on the art after the text, since my publisher needed the text first to allow for the time-consuming task of fact checking and editing. I use models to pose for the queens, whom I photograph in costume. My models are usually people I know who remind me in some way of the character being portrayed. For example, my brainy editor Kris Puopolo posed for the hyperintellectual Amalasuntha, the Ostrogoth queen who was strangled in her bath. Initially, I had planned to do a David "Death of Marat" pastiche, but as Kris posed, a more subtle (and I think creepier) composition evolved. Me: Well I do hope your editor does not share the same fate as Amalasuntha! You mentioned in a recent interview at Scandalous Women that you designed and illustrated Doomed Queens to look like a Victorian penny dreadful. I completely see that, but your style is far more unique. I would describe it as a cross between the decorative motifs of Gustav Klimt with the subtle mortality reminders of Van der Weyden, the idealized beauty of Botticelli with a dash of comic book action. Ha! That’s a mouthful. What artists do you feel most influenced you? Were you influenced by any of the artists mentioned? Kris: Well, all the artists you've mentioned are certainly ones I admire, and who have inspired my art over the years. 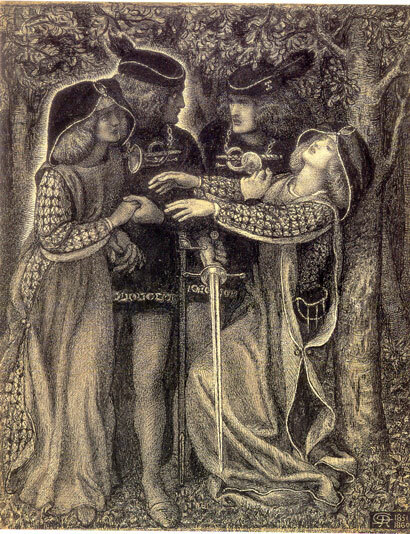 But for Doomed Queens, the artist I most thought of was Dante Gabriel Rossetti, in particular his early pen and ink drawings such as "How They Met Themselves" or "The Palace of Art." I completely adore these drawings, and find them so full of mystery and intensity, for all their youthful awkwardness. Though the final art for Doomed Queens doesn't look much like Rossetti, these drawings were ever in the back of my mind. In the beginning, I had copies of them tacked around my drawing board so I could study them. 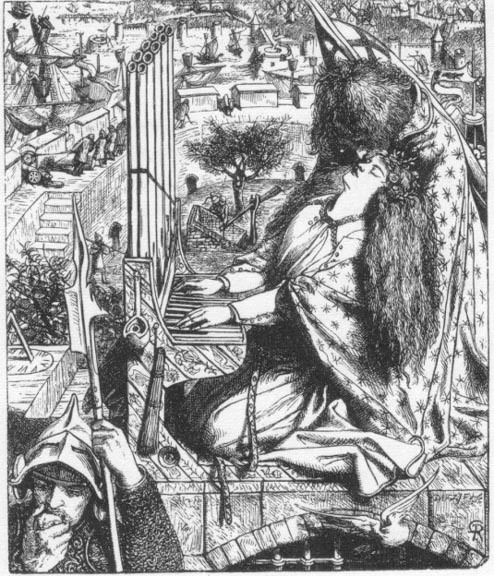 Other influences: the Holbein Dance of Death woodcuts. I also used a lot of historical queens' portraits as points of departure for my art (just you did in your Raucous Royals). For example, it was a lot of fun to take on Velazquez's Las Meninas and kick it up a notch for my portrait of Margarita Theresa. But at a certain point, you have to let go of your expectations and let process take over, especially as deadline anxiety kicks in. Me: Oh the portrait of Margarita Theresa is one of my favorites! I love what you added to her dress (readers are going to have to get the book to know what I am talking about) But if you could pick one painting to be a self-portrait, which queen most represents you? Kris: Of all them, I'd have to say the portrait of Joséphine. But it would be a very twenty-something me; I'm still tall with a long neck, just a tad less sylph-like than I was as a young 'un. I was tempted to pose for one of the queen portraits, but didn't -- sometimes I do that in my illustrated books. Now I wish I had, though it seemed a little grand at the time to do so! The model for Joséphine was my daughter's babysitter, Cassandra O'Neill, who is very tall and languorous looking. I had a lot of fun dressing her up and posing her in the style of an Empire portrait. She was a very game and patient model. Me: Now that’s putting your child care to work. 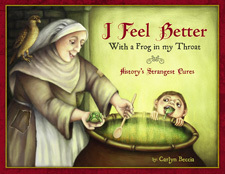 I think I might ask my babysitter to pose for a 17th century bloodletting scene. Thanks for the tip! What about your future plans? Will fans see a Doomed Kings? Kris: Right now, I'm still recovering from finishing Doomed Queens, as well as the lead up to publication. It was a lot of work over a period of about eighteen months -- a real whirlwind. Since the book was a one color book -- sepia ink on paper -- my publisher opted to print domestically. The book didn't go on press until mid-August, a mere two months before its release date. So I was working on the book up until then, then immediately moved onto preparing for publication. This was a very different experience from illustrating a full color book, which are usually printed overseas with a nine month lead time; by the time those books come out, I'm usually already well onto the next deadline. That written, there are plans in place for a Doomed Queens follow up book, as well as other illustrated publications. Everything is still in the "too soon to share details" stage, but I will keep you posted! I also have a small studio-gallery here in Brooklyn, which is oriented around book arts, which keeps me very busy. 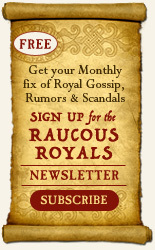 I will be raffling off a copy of Doomed Queens to one lucky subscriber of the monthly Raucous Royals Newsletter. 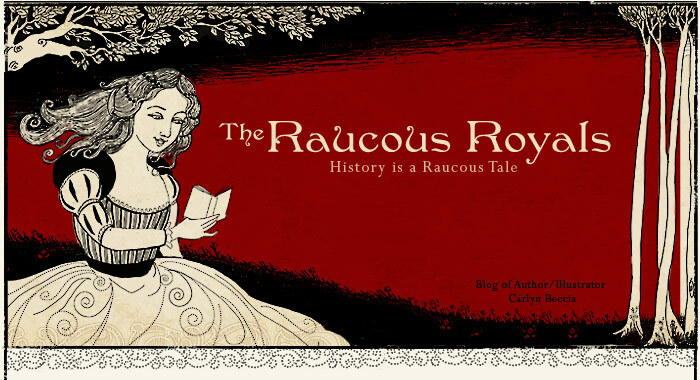 The Newsletter is going out on the 14th and I will announce two winners then - one for The Raucous Royals (last week's giveaway) and one for Doomed Queens. (switching to my announcer voice here) That means you have DOUBLE the chance of winning a FREE book. Act now before it is too late...If you have not subscribed yet, just click here and enter your email and name. Wow! Both of these books are on my Christmas list so I'm thrilled by this contest! Thanks- great interview- so interesting. Well, if I don't win it, I'll definitely be buying it! Thanks for a great interview. Always fascinating to read about the process. I would love to read doomed queens! I might actually buy it if I don't win it :) Or, get someone else to buy it for me. I can't even imagine the amount of work that goes into an illustrated book like that!